Having a comfortable mattress to sleep on all but guarantees a comfortable sleep, without any discomfort or body pain. Most individuals complain of severe pain in their neck, shoulder or back region which is the main reason of their being unable to enjoy a relaxing night’s sleep. When you feel tired and sleepy all day long, you have your mattress to blame! It is the reason behind all the pain that you have to suffer during the day. Yes! That seemingly innocent piece of foam on your bed is the real reason why you can’t sleep all night long, and have to toss and turn the long hours of the night trying to find a comfortable spot, so you could ensure a couple of hours of rest. All that tossing and turning results in a sore body, aching with pain, and a tired mind which is deprived of much needed rest. So, how can one ensure a relaxing night’s sleep and an active mind? Simple. Change your mattress! If you want to avoid the recurring pain in your neck, shoulders and back, then you need to find a mattress which provides support to the body and keeps you comfortable all night long. A mattress which conforms to the contours of the body, and offers a firm support is exactly what is needed to avoid body pain and discomfort. With no need to toss and turn throughout the night, one can enjoy a refreshing and relaxing night’s sleep and wake up rejuvenated, ready to take on life. KEETSA offers the solution in the shape of the KEETSA Cloud – the ideal solution for a comfortable night’s sleep. The KEETSA Cloud – What Is It? The clue is in the name itself! The KEETSA Cloud offers the solution to troubled and tired individuals, who are distressed with their mattresses and seek a bed which is as soft as a cloud! The KEETSA Cloud is a wish come true for many! The KEETSA Cloud has a body conforming mattress design which ensures maximum comfort at all times. The structure of the foam conforms to the contours of the body and provides the required support to pressure points, which prevents the occurrence of pain in the neck or shoulder region. The mattress has a firm support structure which provides much needed definite shape- the first requirement of a good mattress. A firm structure ensures less discomfort, which usually results from a mattress which has too soft a shape. It is the firmest mattress KEETSA has to offer and ensures a sleep free of any pressure on the body. The KEETSA Cloud has an innovative memory foam mattress which has been expressly designed to deal with the problem of tossing and turning that is experienced by most individuals. With a comfortable mattress to sleep on, the tossing and turning problem is dealt with suitably, reducing the chances of body pain caused by a restless night. The memory foam is cradled with supportive foams, which all come together to give the mattress its firm shape and a unique core. The core design ensures reduced motion transfer which guarantees a comfortable night’s sleep. The KEETSA Cloud is the ticket to enjoy the fantasy experience of sleeping on a cloud! The mattress is made from specially manufactured memory foam, called as BioFoamTM. This is manufactured by replacing 12% petroleum with castor oil, to ensure a more environment friendly product. The mattress design uses EverGreenTM, which is a green tea extract used to keep the mattress fresh for a long period of time without the use of any chemicals. The EverGreenTM extract is a natural alternative against artificial deodorizers and chemical treatments. A firm mattress which has a soft touch to ensure less discomfort caused by tossing and turning. World class mattress quality available in an affordable price range. The memory foam used in the mattress is a viscoelastic foam which has been approved by the CertiPUR-US. It has been tested for high performance and durability. The mattress has a latex top layer, which is naturally mold and mildew resistant and also has anti-bacterial qualities. The latex top layer is 100% natural cotton fabric. The Textile Exchange has certified it as an OE 100.
Who Needs A KEETSA Cloud? Anybody and everybody who wish to enjoy sleeping on a cloud and avoid the excruciating pain in their back and neck muscles due to constant tossing and turning needs a KEETSA Cloud! As the name implies, it is just like sleeping on a cloud! 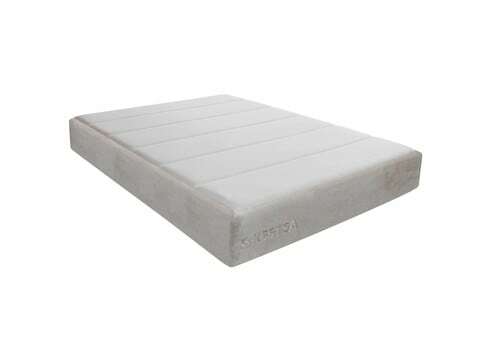 The firm support structure of the mattress, along with the unique core design, offers the user with a highly relaxing and comfortable sleeping experience. To avoid back pain, enjoy a refreshing night’s sleep, and make an environment friendly product selection, the KEETSA Cloud is the obvious choice!